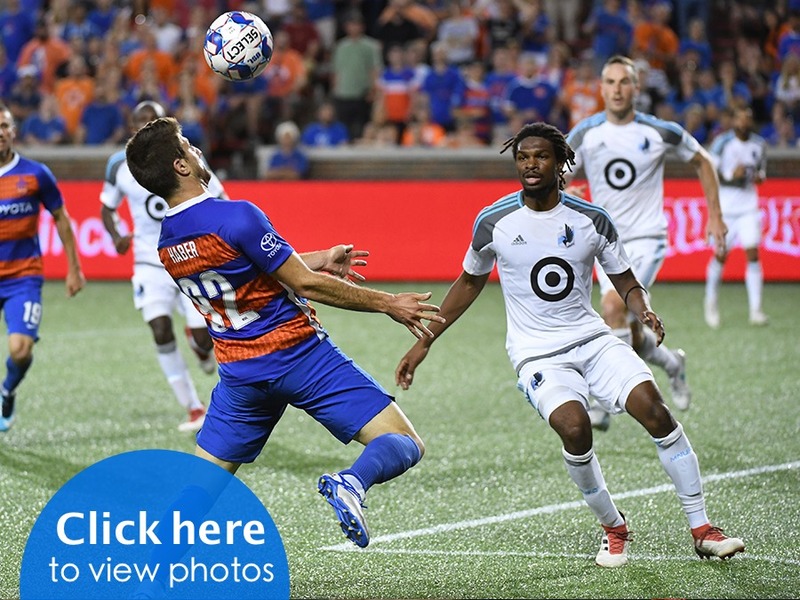 FC Cincinnati took Major League Soccer's Minnesota United FC into a shootout after 120 minutes of scoreless soccer but couldn't duplicate the magic of its last U.S. Open Cup game decided by penalty kicks. The United Soccer League East Conference leaders fell 3-1 in penalty kicks Wednesday in a Lamar Hunt U.S. Open Cup fourth-round game played in front of 15,486 fans at Nippert Stadium. Minnesota advances to the Round of 16 with the tournament re-draw set for Thursday. Cincinnati was playing in its fifth Cup game that went to extra time, including a win in penalty kicks against Chicago Fire SC last year in the Round of 16 en route to a semifinalist finish. Last year's run ended in extra time against New York Red Bulls. "Penalty shootouts are an absolute lottery," FCC coach Alan Koch said. "We went through that last year, obviously. Anything can happen, and a lot of that is momentum. Unfortunately, we didn't get that straight out of the gate. That's it. "There's no point in putting your heads down. They should be very proud of the effort they put in place tonight and, to be honest, as an entire club. We are yet to lose a game in 90 minutes to an MLS team." FCC went toe-to-toe with Minnesota for 120 minutes, at times outplaying the Loons -- though it doesn't necessarily show in the stats. MUFC finished with a 66 percent possession time advantage, which was swayed heavily by a first half in which Cincinnati sat back early and absorbed pressure before finding a rhythm on offense. The Orange and Blue came into the game knowing they would have to take advantage of counter attacks, according to midfielder Jimmy McLaughlin, because a second-tier club just isn't going to dominate a game against an MLS opponent. MUFC carried possession through strings of passes, whereas Cincinnati did more on the dribble, but that wasn't unexpected. FCC ended up outshooting Minnesota 15-10 but had just two attempts on target, while Spencer Richey had four shots to save. "I'm tremendously proud of our team tonight for how they performed through the course of 90 minutes, 120 minutes," Koch said. "I think they went out and did everything we asked them to do. A lucky bounce here or there and who knows, maybe we win the game in 90 minutes or 120 minutes. But, we're a second-tier club, and to be quite honest, to go play like that against an MLS group where I don't think you could really tell the difference who was in the first tier, and I'm very proud of our group of players for giving everything they can for this club. They are fighting for us right now in the USL, and they are obviously fighting to be part of the journey with the club as we move forward." After playing well through 90 minutes of regulation and two 15-minute extra-time periods, it was unfortunate the game had to be decided on penalty kicks -- a lot of which comes down to luck. Richey guessed right on Minnesota's first kick but couldn't get enough of a hand on it to make the stop, and then midfielder Kenney Walker hit the crossbar on Cincinnati's first attempt. After that, Loons goalie Bobby Shuttleworth saved Sem de Wit's kick for a 2-0 lead, and FCC couldn't recover. Michael Lahoud made his try, and then Richey kept his team alive by stopping Minnesota's fourth kicker, Collen Warner, but the game ended when Shuttleworth made the save on Nazmi Albadawi's attempt. Mitch Hildebrandt saved three of the four kicks he faced in penalties during last year's Round of 16 win against Chicago, but that was a rare feat not to be expected to happen again. Richey only guessed wrong on one shot but couldn't quite reach two of the three he dove for correctly. "It's obviously difficult to pick one or two out, but at the same time those guys are expected to make them, so that's kind of the mindset that myself and I know lots of goalkeepers go into it," Richey said. "You try to save one or two and give your team a chance to win it, and all the pressure will kind of be on the strikers. It's unfortunate tonight their keeper made a couple nice saves and missed one. The guys played well, and it was just unfortunate." For a team that dramatically advanced to the 2017 Cup semifinals with four 1-0 wins, it seemed only fitting for this one to go into overtime. FC Cincinnati's first game against a Major League Soccer opponent since learning it would be joining the top division last week was also its last as an underdog. FCC joins MLS next season and will be entering the Open Cup in the fourth round as a favorite or at least on even ground if paired against another MLS club. Though last year's run taught teams not to overlook FCC, the fact remains that Minnesota has a $7 million-plus payroll and one player who makes more than all of Cincinnati's roster combined. Cincinnati played well under those circumstances, even while facing a Loons lineup that featured seven of the starters from Sunday's league game against Sporting Kansas City. The four other players in the opening lineup were all spot starters. Cincinnati was playing without starting center back Forrest Lasso, goalie Evan Newton and scoring leaders Emmanuel Ledesma and Danni Konig. "It's been an awesome Cup ride," Koch said. "We would have liked to have gone further of course. A couple of those penalty kicks go our way and who knows where we go on this journey, but to go beat Detroit, who were not easy in the first game, and then to go to Pittsburgh and be the first team to go score on them there and the first team to beat them at their place this year, those were two major victories along this journey. "To be quite frank, to get to penalty kicks against Minnesota is also an achievement. But the sky is the limit for this group. We are disappointed. We were doing everything we could to get a result." Sem de Wit: The 2017 late addition has been slow to get on the field for FC Cincinnati this season but got his second U.S. Open Cup start at center back Wednesday and played the part of a regular, not coming off the field. De Wit was a key to FCC's back line play, which absorbed Minnesota's attack early on and held tight for 120 minutes, and he also worked himself into the offense. De Wit had three shots, one on target from about 40 yards out, but his penalty kick – as Cincinnati's second shooter – was saved. He joined the club last July and started nine of the last 10 games of the regular season but has yet to make a USL appearance this year. Emery Welshman: The center forward gave Cincinnati some good chances, including a game-high four shots, and Minnesota was forced to play him tight but FCC continued to try to get him the ball. Despite heavy pressure, he seemed to move well with the ball and had one near goal when he toe-flicked a shot into the side netting that tricked some fans into thinking FCC had scored. Spencer Richey: Richey couldn't match Hildebrandt's performance in last year's shootout win over Chicago, but that doesn't detract from his play. He had one diving save in the 29th minute that he was able to force over the end line at the last second and finished with four stops in addition to the save he made in penalty kicks. He read three of the four kickers correctly in deciding which way to dive in the shootout, and it just happened the Loons keeper had a little better night.